Unified by the common language Latin, the people of Italy eventually concentrated their political center in Rome. The Roman government sponsored large scale building projects that included basilicas, racetracks, theaters, public baths, aqueducts, housing and new towns (Stokstad, 134). Roman art can be divided into the Republican and Empirical periods. 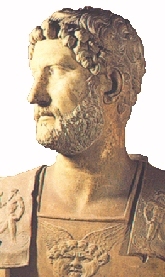 The last of the Roman kings were overthrown in 509 BCE, and the Republican form of rule, controlled by the Senate, was adopted. Art and architecture was influenced by both Etruscan and Greek models. The standard temple was Etruscan in form, decorated with engaged Greek columns. 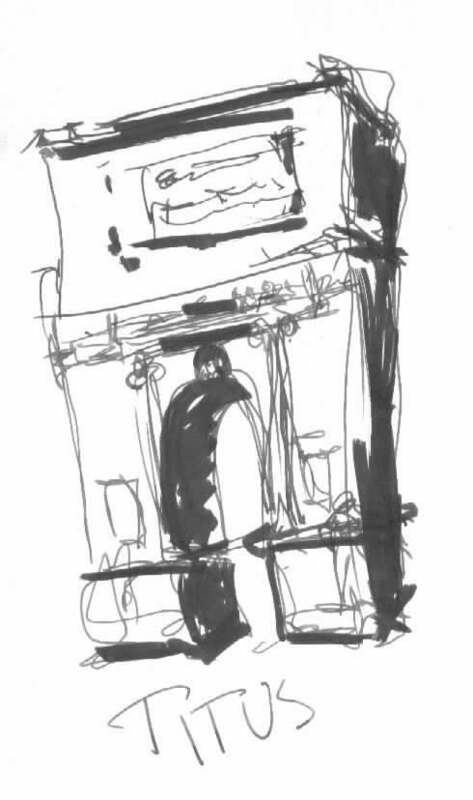 Secular architecture included domestic apartments and houses (examples at Pompeii); aqueducts, or levels of arcades to transport water; triumphal arches such as the Ara Pacis, to commemorate the victory of Augustus; colosseums, constructed in concrete and decorated with increasingly complex engaged Greek columns; and basilicas, great halls used as administrative centers. The greatest Roman accomplishment in architecture is the Pantheon, a giant rotunda with an entrance porch featuring Greek elements. The interior of the building is covered with a coffered dome centered by an oculous. Relief sculpture, such as that of the Ara Pacis, became increasingly complex, depicting individuals and suggesting spatial depth "by carving the closest elements in high relief and those farthest back in increasingly lower relief" (Stokstad, 138). Sculptures on the Arch of Titus have an even more dynamic quality, insinuating that the marchers are moving toward the arch. 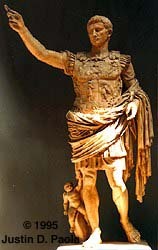 Free standing sculpture was used mainly for political propaganda, such as the statue of Augustus of Primaporta. Equestrian statues, such as that of Marcus Aurelius, were also popular for the glorification of leaders. Wall paintings included all subjects, even false architecture. "Trompe l'oeil" was also popular in mosaics, located mainly on the floor. For a brief period in the third century there was a shift toward the abstraction of figures and the simplification of form, as seen in The Tetrarchs, a symbolic representation of the four-man political rule of the period. The Arch of Constantine combines new works in this simplified sculptural style with pieces of sculpture taken from earlier works, executed in a more naturalistic style. Temple of Fortuna Virilis, Rome, ca. 75 B.C. Temple of the Sibyl or of Vesta, Tivoli, early first cent. B.C. Head of a Roman patrician, Marble, approx. 12 ca. 75 - 50 B.C. Atrium, House of the silver wedding, Pompeii, early first cent. B.C. First Style wall painting in the fauces of the Samnite House, Herculaneum, late second cent. B.C. Dionysiac mystery frieze, Second Style, Villa of the Mysteries, Pompeii, 5 4 h. ca. 60 - 50 B.C. Gardenscape, Second Style, Villa of Livia, Primaporta, 6 7, ca. 30 - 20 B.C. Thirds Style, Villa of Agrippa Postuxnus, Boscotrecase, 7 8, ca. 10 B.C. Portrait of Augustus as general, Prim aporta, Marble copy of bronze original, 6 8, ca. 20 B.C. Ara Paci Augustae, Rome, 13 - 9 B.C. Pont du Gaurd, near Nimes, France, c. 16 B.C. IV - (intricate) combinations of previous styles - "trompe l'oeil"
Portrait of Augustus as general from past: contrapustto, oratorian gesture, dressed in armor, bare feet (indicating person is deceased).